Inquiring minds want to know! :? I never bought a Magellan gps because of known support issues and Motorola is well on the way to getting the same bad reputation. Their marketing techniques have raised a few eyebrows as well since they hit the market this past Spring as being a bit unconventional. I think I first saw it on the Home Shopping Network. I bought mine at NewEgg for the $200 price and I have noticed that their "catalog" now only shows one Motonav unit for sale - the TN565T for $249. Inventory is dwindling it seems. It is still available on other sites, Amazon, Radio Shack, J&R. in the $275 range. Not me......after I let my trial subscription expire tho, I see that the "fuel prices", "flight status" and "weather" icons have been completely removed from the main menu list. Because of that fact, the total area of the Main Menu area, has shortened a little bit in its total length. i don't know where i was goign with that. hmmm. where was i going with THAT? Hahahahaa, thanks for a refreshing bit of humor, Camel. In reading some posts "over there" it could be there is some confusion going on with CS reps when the name "Motonav" is mentioned and we call in as PND users and not mobile phone users. Just a guess. MOTOEXTRAS is the official map update portal for a growing number of personal navigation devices. As you can see Motonav software and maps are being sold to mobile phone users. Anyone using Motonav software on any of the above mobile phones? Your refund of $44.00 will be reflected on your next credit card statement. We hope that you continue enjoying your MOTONAV mobile application. 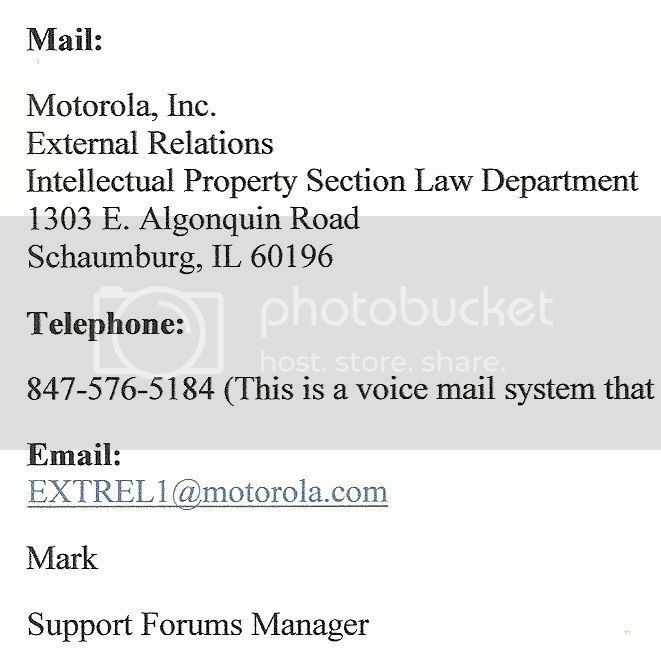 If you have any questions or feedback, please don’t hesitate to contact us at www.motorola.com/support. We also invite you to visit www.motorola.com/motoextras/mobile to purchase additional content. you may have hit the hail on the net. could be their confusion (or ours) WRT MOTONAV vs Motorola. we need to be sure we clarify that when we talk with Motorola Customer Service. Raul - There are several users of the Motonav PND/GPS units that are experiencing serious problems with a recent update available through the MotoNav Toolbox. Many users are active on GPSReview.net forums and are now porting their frustration/problem here to the Moto forums. Motorola does not seem to be acknowledging the fact that there is a problem with v8.5.5.139160. My question to you is - can you and are you willing to supply me with a direct contact to the TN765T support team so we can contact them directly? An email address would be fine and/or a telephone number and NAME of a Moto employee would also be helpful. EXCELLENT research Spyder!!!!! Great going!!!!! I apologize for the inconvenience and regarding your concerns, for us to be able to help you with your concerns. I need you to call our Customer Service Department at 800-331-6456 and ask the agent to transfer you over to our MotoNav Department. Our MotoNav Department is the one handling TN765t and other motorola navigational devices. We hope that you find this information useful and look forward to assisting you in the future. I will be calling the above phone number tomorrow and we shall see how it goes. As they say, "film at Eleven". Another "incident" listed is a result of a post I saw that listed support phone numbers and it asked if the post was helpful. I replied it was not helpful due to lack of a contact number for Motonav PND/GPS units. On another note - No reply from Raul as yet. Thats great Spyder, that you had gotten a reply from them. I, too, recieved virtually the identical respone, that you had just gotten. However, my was signed by "Dave". The phone number you had gotten, is the Tech Support HQ`s there in Illinois and thats where I left a detailed explaination also, of our problems. Please DO call them again, to get them on the ball, if you would please. On a lighter note, I went to downtown Charlotte today and observed numerous 3-D buildings on the Motonav. Pretty nice! A bit more detail than the Garmin 765T. Nice eye-candy. Also, I noticed when you navigate to a destination, the final destination is marked by a waving checkered flag. First time I've seen that in a GPS. Nice touch! Hey guys, Ive been having an issue since the last update that entails losing all sound. If I hard reset it, all is fine, if I turn it off and on (fully) it works again, until it does it again. Anyone else have this annoying issue? Should I perform a MASTER reset? Sure. GoTo Main Menu -> Settings -> System -> Scroll down to "About" , Tap and there it is labeled as Version. Well apparently my backup is with the buggy update. I have a friend who has this same GPS, could I restore his data? according to Victoria, in CS, NO. not only that, we don't know the file structure system so we don't know what files' names are back up files. there was a guy in TX that was looking at it-and Spyder was going to try to figure out the structure, but that never happened to my recollection. Also, is it possible that I could possibly restore via his backup? no beccause the toolbox knows which unit is which, by s/n and there's no way to change s/n in toolbox (that we know of). I don't mean to steer the thread away from the 160 update, but my major problem with the 765t is finding addresses. I couldn't find it in the POI database which I thought was strange as the POI database is huge, the complex is huge, and the POI is in my Garmin and Tomtom but that is besides the point. The biggest problem is that it couldn't find the address. It did give me a couple of alternative address is different towns but they didn't seem right. I had to finally take out my old Tomtom to get me there. This isn't the first time I have had this problem. Entering addresses takes forever and the options it returns are not in the town you entered. If anyone can figure this out, I would appreciate it. You may want to try entering just the facility name and letting it search by proximity? Please let us know if this works! If so, I'd love to be able to restore to the "59" version, as I am currently stuck on "50" (the only update being "60" which,as you know, has some serious issues!). I would just take someones "59" backup, do the s/n mod, and drop it into the default folder for the Toolbox. I do know about the Township name thing and have had problems with Magellan until they did a firmware update as well. Unfortunately, in this case, the facility did not come up in the search and I have no idea what the township name is for Northport. The options it came up with for that facility and also the street did not seem correct and rather than chance going on a wild goose chase, I got out the Tomtom. ...keep in mind that the software may take the s/n from the text file and manipulate it somehow for security purposes (i.e. convert it to hexadecimal and imbed it in another section of the code). Don't be surprised if it doesn't take. I just learned that you can scroll though any menu by dragging with your finger, like an iphone (though not as smooth). You don't need to hit the up or down arrow. :D Much easier if you're traveling down the road and can't be as accurate when touching the screen. did your contact (the supposed supervisor) give you any new email address (his, someone elses, etc.) that we can add to our "distribution" list? The day just keeps getting brighter and better. I got a reply from Mark the Moto Forum Admin and his reply to my question and others about the possibility of setting up a MotoNav PND/GPS Community or Group to get us out from under the somewhat clandestine heading of Accessories. "Thanks for the feedback. Your suggestion is certainly an option! I am actually trying to get our navigation team on the community to be more closely engaged. I can't promise that the Navigation community will be moved to a main community as it is quite small still. I can consider separating it a little more if it helps you have better cohesiveness. Standby, I'll see what I can come up with for you. need no stinkin' Tom Tom! Right On oh Arac no phob! In response to your question, Camel. No, I did not pursue any further names from "Edwin", I was going to give him a day or two to see just what exactly he may of accomplished. However, this is the info I recieved earlier, and as Spyder has said, they are finally aware of us tn765t owners "over there"!! But as I originally wrote, I had the address as well and the 765T couldn't find the address either. Google or no, this gps failed me. The Tomtom database had the hospital in it AND it was able to find the address as well. Hope to track here but am headed out for a long needed rest and recuperation (or what's commonly called a dip in a lake with a lot of booze). we'll be sneakin' around so you guys (and gals) behave. y'all hea? My Camel, soon to be wetting his hump(s). When you find the perfect gps be sure to let us know because we are all searching for it as well. Hey, bottom line is I'm sure there will be instances or comparison points where another GPS may have its moment of glory, but overall, this is a great GPS. Not perfect, but better than any that I've come across in my geek-o-centric searches! So, yeah, it may stub its toe on occasion, but for me, the overall user experience has been awesome! I found the perfect gps 16 years ago yesterday. Still works too! My wife, who doesn't hesitate for a second to let me know I'm going the long way around. Quick to recalculate too, tho I wish I could change the announcement voice sometimes. The speed alerts are a bonus.